How would you characterise the hospitality and tourism industry in Lagos as we stand now in the second half of 2016? What are the trends? What are the challenges? The industry is under pressure in the second half of 2016. It might get tougher and not easier. This is due to low economic activity as we are in a recession. On top of that we have the Forex issue. Low occupancy means that no one can increase the prices so the industry of hospitality is under pressure. Any product imported or any expat costs are very high so that is also putting pressure on the industry. On the restaurant side, I think there is less pressure but still in any recession people go out a bit less. However this is now for the second half of the year but we do hope that for the second part of next year things will start to get back on track. Many of the big projects for the hospitality industry such as hotels have been put on hold. The thousands of hotel rooms that we heard were coming are mostly on hold. This can actually be helpful because in fact as those rooms are not coming onto the market that quickly it means that the existing ones will have time to recover and adjust before those new rooms arrive. Basically all those stories of 2017 and 2020 about all the rooms coming have been delayed by at least 2 or 3 years. Our hotel is a 4 star hotel with a 5 star service. Basically what we want to create is a home away from home feeling. We have long stay customers with us. We try to be very customisable. We know our clients very well. People come back to us. 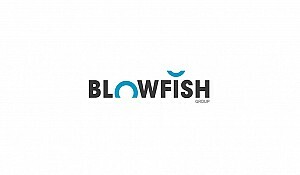 How is the above affecting Blowfish Group? What measures are you putting in place to sustain the current situation? You have to work on two things, first of all because the economic pressure is high you have to fight on all sides for example offering the right packages and promotions and doing more online communication; basically trying to find every possibility of promoting the group and its activities to protect as much as possible the top line. However the important work in any recession is on the costs, so reducing the costs without reducing the quality of service. This is always a challenge. We started this transition two and a half years ago when we started restructuring the group. We have done a lot of it but there are still some optimisations and things to do to increase efficiency. In most cases any double costs were just taken off. We have reduced our exposure to dollars as much as we can on different levels. Those are the main things that we do. We are reducing costs and increasing efficiency. You can protect the top line as much as you want but at the end of the day we are still in a recession so working on costs is the main thing as well as protecting the cash flow because in a recession the cash flow is the key figure. Let’s talk about the Blowfish Hotel. What do you bring to the market? What segment of the market are you catering for? Our hotel is a 4 star hotel with a 5 star service. Basically what we want to create is a home away from home feeling. We have long stay customers with us. We try to be very customisable. We know our clients very well. People come back to us. We have a lot of loyalty to the brand. That is very important for us. We usually have a lot of corporate clients, we still have a lot of them but perhaps because of the economic recession the plan is a bit different as the corporate side is less active. Understanding the client and complying with their needs is key for us. Until now we have been proven successful. Every month Expedia ranks the top 10 hotels that have been booked via Expedia and we are always in the top 10 and very often in the top 5 and the other hotels are all international hotels which have their brand all over and big companies will only book with them. This shows that what we are doing is hitting the right target. Let’s talk about your other venues. Tell us about the restaurants. We have 5 restaurants with 9 different cuisines. We have La Veranda which is an Italian restaurant. It is a cosy place and a lot of the business for it comes from business lunches. It has a nice veranda that gives onto the hotel swimming pool. I think the food is very nice, I am very proud of the cuisine and the products that we are offering. We put a lot of effort into the ingredients to have the high end products. At La Veranda you have the feeling that you are outside of Lagos. It is very relaxed, you can come with friends, have a romantic meal or for business. I think it is a nice place to go. With a nice glass of Chianti and a nice plate of pasta you can have a lovely evening. Purple is something a bit different. It has seating inside and also by the pool. 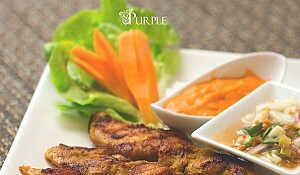 It has multiple cuisines; the Indian and the Thai are particularly excellent at Purple. We offer other cuisines such as continental, Lebanese and Nigerian cuisine. We have two chefs from different areas. We have chefs from India, Lebanon, Nigeria and Benin so we have chefs from all over the world trying to create as much as we can, and I hope successfully, flavours from all over the world. It is also the main restaurant that caters for conferences and things like that. For me it is the restaurant where I go all the time. You can always find something there that you want! Velvett was the new baby of the group. It offers fusion and international cuisine as well as Lebanese cuisine. The grills at Velvett are really nice, the steaks and the fish are delicious. It is a lounge so it is very relaxing environment and very trendy. People enjoy going for a drink or for dinner. The steak and the fusion food are outstanding. It also offers another option because as it is a lounge, two nights a week we have some events, not like a nightclub but there is music and so people can stay a bit later, not for a party but for a pre-party. We do international music every Saturday and Nigerian music on Fridays. It is a lively place to be. It has a very nice brunch, one of the best in town, on Sundays. What about the Jazz Night? The Jazz Night will be coming back but for now Velvett is too small for it. In October it will be starting again. The Jazz Night is a big attraction. We do the biggest jazz night in Lagos and it will now be in the Blowfish Hotel. During the rainy season we stop it and then it comes back. 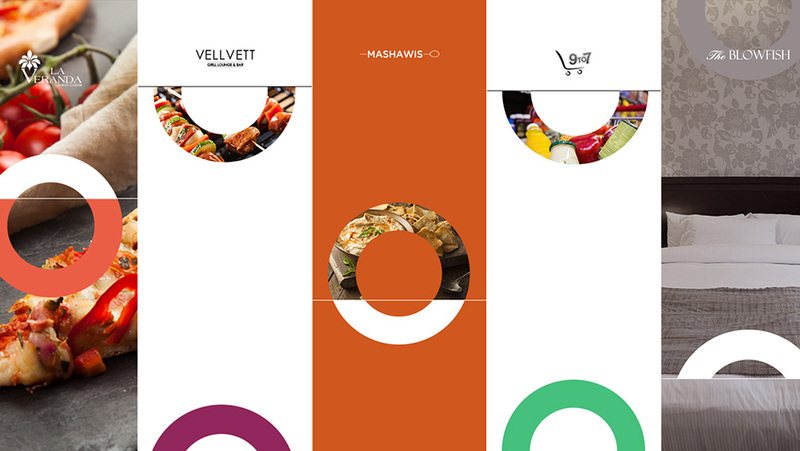 Mashawis is a small outfit that does Lebanese mezze and grills. It is a small snack bar but the main business is for delivery and takeaway. It is an outlet that is working very well for us. Izanagi is known by everyone here. I think it is a very good Japanese restaurant. We import more than 90% of the products. We have a very big variety and it is a very Zen environment. The cocktails are very nice also. You can only eat good black cod in Lagos at Izanagi. It is very difficult to find good black cod outside of Izanagi to be honest. Apart from the measures that you have to put into place because of the current economic situation, what is the strategy for the group going forward? Are you looking into opening new outlets? We have two events coming up in Blowfish Hotel and two in Velvett. 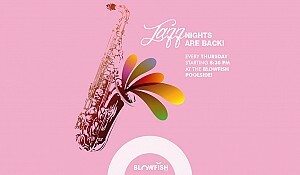 In Blowfish Hotel we have the Jazz Night on Thursdays and we are going to create the BBQ Night on Sundays I think. We are finalising things on that. 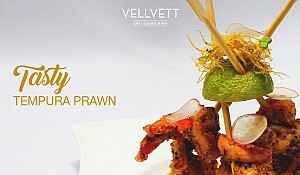 In Velvett we have the brunch on Sundays and we have the International music on Saturdays. Outside that, we are expanding on catering; we cater for outside services as well as inside. The group has just secured two new contracts that will start at the beginning of next year for catering. We will also be opening two new restaurants between now and next year. Also as you know, the group has a supermarket as well so a big part of our growth will come from the supermarket. We are going to create a new hub. We are going to expand the supermarket and create a bakery. We are going to create two new restaurants with specific themes here in the same area. However the next step for the group is to create more supermarkets and new hubs. What do I mean by new hubs? I mean that in the same place we open a supermarket we will open a few restaurants. We will not be expanding on hotels. That is not in the strategy of the group. We are creating supermarkets and restaurants.